Reporters Without Borders is a fully funded organization receiving money from the National Endowment for Democracy, USAID, International Republican Institute and George Soros’ Open Society Foundation. They tried to shut down a discussion about “White Helmets” put on by the Swiss Press Club in Geneva. Self-proclaimed “press freedom watchdog” Reporters Without Borders launched a new campaignthat it deemed of urgent importance – shutting down a short panel discussion by journalist Vanessa Beeley and Swedish Doctors for Human Rights. The USAID/NED-funded RWB wrote an open letter published in the Tribune de Geneve addressed to Guy Mettan, Executive Director of the Swiss Press Club, the organization that was hosting the event, where it dismissed Beeley as a “so-called” journalist who is cited only by “Russian media propaganda” and claimed that Doctors for Human Rights is merely “a tool of Russian propaganda.” The letter urged Mettan to cancel the event or risk tarnishing the image of the Swiss Press Club. The event was entitled “They don’t care about us: About White Helmets True Agenda,” where Vanessa Beeley, who has reported extensively from inside Syria would present alongside fellow panel members Richard Labeviere’ and Marcello Ferranda De Noli editor of the Proche et Moyen Orient and Swedish Doctors For Human Rights respectively were scheduled to present. As the title suggests, the event was merely a platform to discuss the possibility that the reputation of the White Helmets in Western countries may be different from the reality on the ground. Beeley was included not only because of her expertise in terms of research but also because of her extensive on-the-ground experience in Syria, her length of time in country, and her numerous interviews and investigative reports from Syria itself. 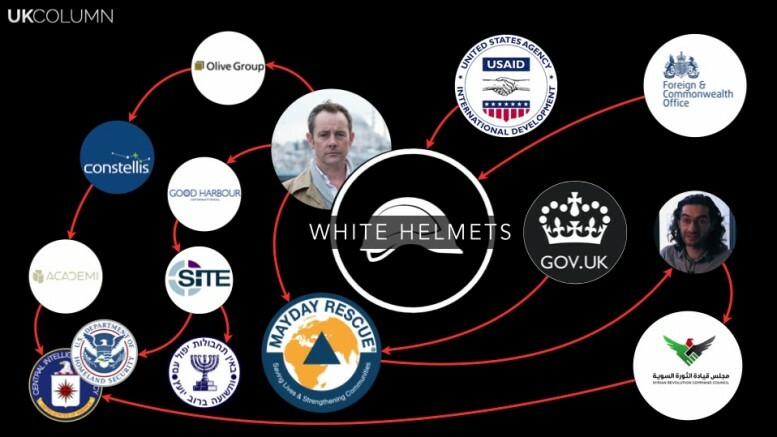 Faced with the impending reality that the White Helmets would be exposed in this short presentation, Reporters Without Borders resorted to what State Department backed engines of deceit and Western propaganda outlets typically resort to – bullying and censorship. Ironically whining about Russian propaganda in its letter, RWB immediately calls on a press club to censor and silence statements from a reporter that do not fit the State Department narrative, thus exposing its own narrative as propaganda or, at the very least, one based upon flimsy evidence. Thankfully, Mettan did not back down and kowtow to the calls for censorship. In fact, not only did he refuse but he leveled a healthy dose of criticism back at the RWB organization. “For the 20 years I have been working at the Swiss Press Club, I have always been under pressure to prevent people from expressing themselves. But so far these pressures have always come from authoritarian or dictatorial regimes, such as China, Saudi Arabia, Egypt or Bahrain,” wrote Mettan. This is the first time that a defense organization for journalists from a democratic country has sent me such a request. It goes without saying that I cannot act on it. It would dishonor a job that, I hope, is still yours. Mettan called for the RWB to attend the event and present its view rather than call for censorship. LifeStraw – Clean Water, Anywhere, Anytime – Free Today! Thus, there should be no surprise to anyone that Reporters Without Borders would launch a jihad against any facts or alternative opinion that does not coincide with the narrative peddled by the U.S. State Department. After all, it is just one tentacle of the color revolution apparatus and COINTELPRO operation aimed at the domestic population. UPDATE: Thankfully, the event was not cancelled and the presentation continued as scheduled.